Barra de Potosi is still a fishing village and most of the men grew up fishing for a living and to feed their families. Almost all the fish served in the local restaurants is their catch. For the ocean, their craft of choice is a “panga“, an open fiberglass and wood boat driven by a large single outboard engine that they launch off the beach when the mouth of the lagoon is closed or moor in the lagoon when they have access. What they fish for and how they fish depends entirely on the fish, but most often you will see up to a dozen boats going out at sunset; they fish with hand lines for bottom-dwelling red snapper or use floating nets for sierra or mahi-mahi and return at dawn. In the lagoon, they use “pangitas” which are essentially flat bottomed canoes and fish for pargo, snook and shrimp. 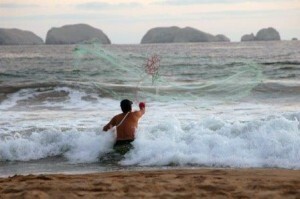 You will also see men throwing hand nets off the beach or off pangas just beyond the surf catching bait. As you can imagine, these skills are easily turned to sport fishing and a group of locals has formed a cooperative that specializes in eco-tourism and in-shore sport fishing. For sport fishing, they usually concentrate on species like roosterfish, jack crevelle and skipjack tunas, but you can easily encounter mahi-mahi/dorado, sierra and even a wahoo. They fish from pangas, the open boats you see at the mouth of the lagoon. A five hour fishing trip currently costs 1800 pesos, substantially less than the outfits in Zihuatanejo charge. The captain will supply equipment and soft drinks, although if you brought gear, you are welcome to bring it. Generally they motor to likely areas and keep an eye out for diving birds and boiling schools of fish. They typically troll through promising water dragging smallish lures. But you can also cast into boils from a drifting boat and get powerful strikes. If there is bird activity along the beach, they may come in close to the breaking surf where you can cast into the backside of the rollers in hopes of jacks and roosters. In a community of fisherman, it is not surprising that the concept of catch and release seems ridiculous. Farmers don’t catch and release their tomatoes. But if the sport fishing industry is going to thrive, fishermen need to be judicious about what fish they kill. It is illegal in Mexico to commercially fish for marlin and sailfish. When a sport fisherman catches one, a few Mexican captains will happily snap a souvenir photo and safely release it; most others will routinely kill it and throw it like log wood into the stern of the boat. 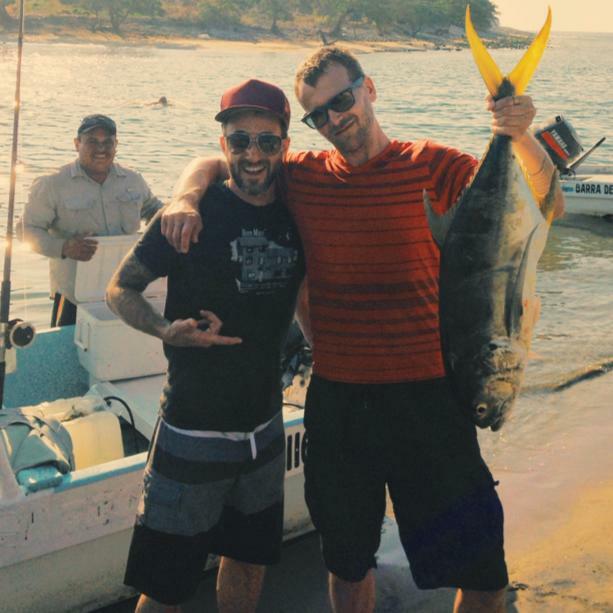 When they get back to shore, they typically will sell the catch to a restaurant where it ends up in tacos. Sometimes the tourist/fisherman has to be forceful and insist at the outset that billfish are to be safely released. There are other fish that have almost no value as food but are fun to catch. It only makes good sense to release them. Roosterfish, skip jack tuna and jack crevelles fall into that category. But it is a rare Mexican fishing captain who even thinks of releasing anything remotely edible, so visiting fishermen have to be clear and direct if they want their catch released. To get an idea of the current fishing action, check out Ed Kunze’s blog. Arturo who co-heads the ecotourism coop is the boat operator on the whale survey project. He also does sport fishing trips. 755-115-4333, 755-104-7168 or 755-557-6902. You also can leave word for him at the Enramada Leticia. Luis Antonio operates the panga “My Three Loves” . Cels 755 124 9303 and 755 119-7362. Ernesto has “Lucky”. Cel 755 113 6123. Jose Antonio has “Tania”. 755 557 2201. The other Jose Antonio runs “Areli”. Cel 755 559 3944. “Irlanda” with Adelaido Martínez has a website- www.barradepotosi.jimdo.com. Cel is 755 121 7352.